TVL Series Vacuum Loaders have a modular design for greater flexibility and efficiency. The no-tool access and push-fit assembly provides fast cleanout for quick material changes. 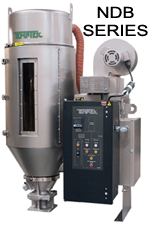 The EM Series Granulators are designed for maximum versatility. These press-side granulators are operator friendly, easy to service and easy to maintain. Precision scissor-cut action provides maximum throughput efficiency. VT Series Mold Temperature Controllers are used to process temperature control to 250°F. 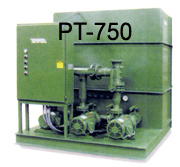 These units use an incoloy heater and centrifugal pump with standard NPT process fittings. Each unit has stainless steel cabinetry with a galvanized steel base mounted on casters. Two levels of microprocessor instructions are available. The LS Series offers To process temperature display and pulsed cooling valve. The LX Series offers To and From process temperature display with a modulating cooling valve. Both models come standard with process pressure gauges and a 10-foot power cord. CF Series Portable Chillers are used for process temperature control from 20°F to 65°F. Portable chillers are available from 1/4 to 40 tons. These units use a refrigerant zone with a compressor and evaporator, along with a reservoir and coolant pump. Water-cooled models (CF-W) use a plant water source for condensing. Air-cooled models (CF-A) use fans or blowers to move ambient air across the condenser. Central Chillers provide economical plant-wide cooling, great for expansions of existing system or new start ups. MA and MW Series modules are available in 5 to 180 tons. 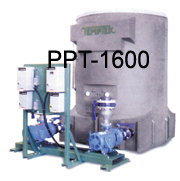 Temptek® Cooling Towers provide cooling water to 85°F (depending on ambient air temperature and humidity). Cooling towers are a part of a central cooling system including pumps or pump tank stations and are installed outside, generally either elevated on a stand or mounted on a roof. Available capacities range from 7 to 540 tons in both fiberglass and galvanized steel construction. Available from 275 to 3200 gallon capacities with 1, 2 or 3 pump configurations. Tank systems can be customized to meet virtually any requirements. Choice of three long-lasting materials: mild steel, stainless steel or polyethylene.